When is a Nazi salute not a Nazi salute? Apparently when it’s a ‘Red Hand of Ulster’ salute. While the Aussie army has marched from one PR disaster to another relating to service personnel’s abuse of personal photos, video posted to social media, the British Army (Sah!) have to contend with some provocative poses allegedly featuring British servicemen stationed in Afghanistan. 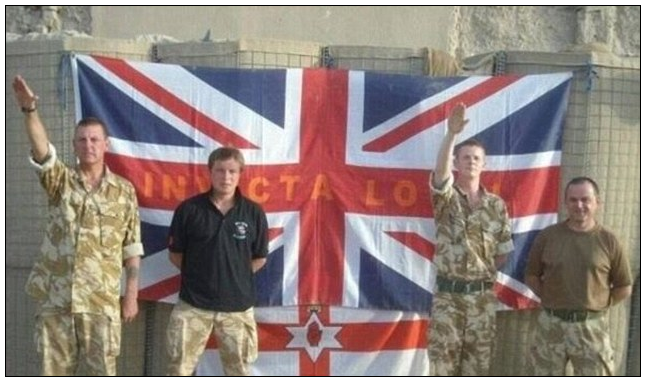 The irony of British squaddies posing in ways that appear (even erroneously) to endorse the right wing foes their forefathers fought to defeat is at best cruelly ironic and at worse…(you fill out the rhyme). From a reputation viewpoint, it’s evidence of how the personal beliefs of a minority can easily besmirch the principles and PR profile of a bigger brand or organisation. A brand or an organization’s reputation is easily damageable and it has to be handled very carefully indeed. Personal belief as mentioned in this article happens to damage the profile of a big brand. Channelizing the thought process of the common public is one of the evident responsibilities of a PR practitioner. In this case did the PR practitioners channelize the thought process of the common public to save the brand reputation?